Joe Chalmers could slot in at left back for Caley Thistle. Brad Mckay has revealed he has taken inspiration from his mother, Rosie, who made her stage debut in a powerful play at the Edinburgh Festival last month. The Caley Thistle defender was thrilled to watch her play a major role in Doglife, the story of a gangland enforcer seeking redemption. It has re-energised Mckay, who is looking forward to Caley Jags’ trip to Paisley on Saturday to take on St Mirren in the Championship. Mckay is also looking forward to facing St Mirren’s Jack Ross, who was his youth coach at Hearts. He said: “It’s something my mum always wanted to do. She was excellent and credit to her because she was a wee bit nervous knowing that I was watching her. “It was a story that was close to her heart. Without going into too much detail she has gone through a lot in her life and there was a part in the play that she related to. “She works in a serenity cafe helping people and one of them is the main character in the play. “She’s a fabulous woman and she has always taught me to follow my dreams. 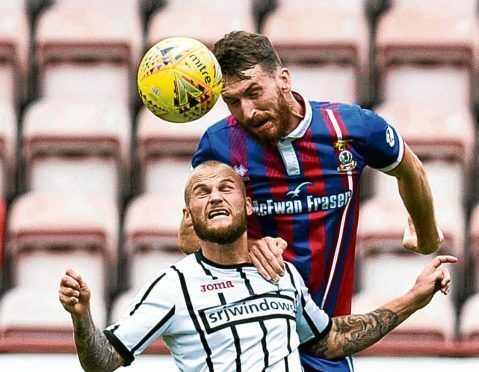 She backed me at school when I was getting laughed at by teachers when I told them I wanted to be a football player.” Inverness have made a slow start to their Championship campaign – in stark contrast to the Paisley Buddies, who hammered Dundee United 3-0 in their most recent outing. But that came as no surprise to Mckay. He said: “I thought the way St Mirren ended last season, and the players they’ve got, they were one of the teams up there challenging. “I also know Jack Ross from my time at Hearts and he certainly knows his stuff. “He also played for St Mirren, of course, so he knows the club well. Mckay reckons the pressure is on Caley Thistle to get back to the Premiership quickly, so they need to start picking up points in away games. He added: “When any team comes down it’s a huge financial loss, so I know that the board want us to go straight back up in terms of the money.